Statement A: The river has crested. Statement B: The river has reached its highest point. Both statements describe the condition of a river. The two statements appear to say the same thing, and therefore — it is claimed — have the same meaning. 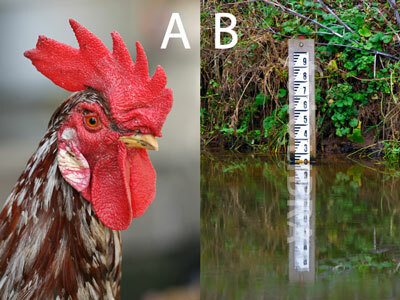 Even if it is not true that these are equivalent — in statement A, the river may yet run higher, contrary to what is said in statement B — it may be claimed that A is equivalent to B, and vice versa. It is a question of meaning. In other words, it may be claimed that statements A and B refer to the same situation. As philosophers and commentators, are we required to resolve this issue,? Do we need to ask “what is the difference between reference and meaning”? First, the meaning of each statement depends on the context of its use. Consequently if the context changes, so does the meaning of each statement. Second, the two statements, when enountered in certain contexts, have a hierarchical relationship to each another. One is more abstract, inclusive, than the other: it is something which has to be evaluated. In the second case, statement B is an empirical statement, so that the data is determined in a different sense than in statement A. Both meanings are data-determined but in different ways. Each says something different. Statement B is related to data is a more “fundamental” way than statement A, which is mostly analogical. This needs to be clarified (see below). When I refer to data, I suggest of course that regardless of how things were described, we would most likely agree that there is a phenomenon we are all aware of which is what is being talked about, and that this phenomenon can be identified and mensurated in a manner which allows us to determine properties reflected in both A and B. To say “the river has crested” is clearly analogical. *Crested* derives from French and refers to (among other things) the comb of a rooster. It refers to form rather than to a (linear) measure and only indirectly refers to how this can be measured. By contrast, B is a reference to some previously adopted perception of scale against which it is being compared. In this sense, statement B is more fundamental. One could also argue that statement A is more abstract than B, that to refer to the river has crested in not only analogical but also represents a more general case and also is more difficult to gainsay. Conclusion: an analogy represents an attempt to state a current experience (event) as a case of a more general event. In this sense analogies are theoretical. Thus, to assert that A is like B — the form of an analogy — is to construct a theoretical proposition whose falsification becomes increasingly more difficult the more analogical it is. Analogies like statement A represent our efforts to increasing the stability of our world in the face of experiential diversity and in that sense, analogies have signifiant heuristic value: they reduce variability, change, diversity. One can question the value of a particular analogy, but this in itself in not a test of an implied theory. In retrospect, the history of human knowledge suggests that we forever seek analogies in the hope that the one chosen is more appropriate than earlier ones, and that the one chosen now will assist us better in unifying the increasing diversity of our experiences of our world.